On a rainy autumn evening in a fairground near the centre of Nottingham, Nick Davies noticed two young boys, no more than twelve years old, and realised that while all around them people were preparing for fun, they were setting out with grim determination to do something very different. Davied befriended the boys and discovered that they were part of a network of children who were selling themselves on the streets of the city, running a nightly gauntlet of dangers – pimps, punters, the Vice Squad, disease, drugs – and yet, most mysteriously, they could not be stopped. They seemed to be drawn towards their own destruction. 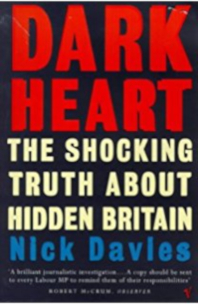 Propelled into a journey of discovery, Nick Davies found himself in crack houses and brothels, he befriended street gangs and drug dealers, he uncovered secret rites and rituals. Davies unravels the threads of Britain’s twisted social fabric as, following the trail of the street children through corruption and violence, he travels deeper and deeper into the country of the poor, towards the dark heart of British society.